At a time when newspapers are struggling, the Honolulu Star-Advertiser is in “fine fettle.” It is solidly profitable and robust in size, even on Saturdays. We’ve been enjoying getting the newspaper delivered to our room, along with the “Times Digest,” a short synopsis of The New York Times, that reminds me we are on vacation. We read the newspapers on our lanai with a cup of Kona coffee and the sound of crashing waves — an experience that persuaded us to consider relocating to the islands about 10 years ago. (We settled for Nevada City to help care for our aging parents and be close to Lake Tahoe). Instead, we just visit when we can. The paper’s longtime editor is Frank Bridgewater. I worked with Frank in the ’80s when he was an assistant business editor at The New York Times, and I was a freelancer for the Times, filing stories about Eastern Airlines from South Florida. I also was a full-time airline writer for the South Florida Sun-Sentinel. Frank, who has a master’s degree in journalism from the University of Missouri (one of the nation’s best programs along with Northwestern and Columbia) joined the Star-Bulletin in 1985, and he was promoted to managing editor in 2000. He now holds the title of Editor and Vice President. In 2013, the Star-Bulletin’s publisher, Dennis Francis, was named publisher of the year by Editor & Publisher. He engineered the merger of two struggling, century-old rivals — the Advertiser (a Gannett newspaper) and the Star Bulletin —into one thriving one. “He believes that a newspaper has to have an independent voice to make it stronger. And, today, this newspaper is stronger,” Bridgewater said of Francis. This weekend’s Sunday edition featured an investigative article “Tulsi Gabbard’s run for president brings questions about past,” as well as other informative ones, including a Star-Advertiser photographer who set out to capture images of Great White sharks (see video below). The Dining Out insert was thick with ads. The paper has embraced a “digital-first” game plan to compliment the print edition. Turnover at the newspaper has been minimal, thanks to respectible new labor contracts. The newspaper also is known for its generous charitable contributions. This has been good for Publisher Francis too. “If fate had dealt Francis different cards several years ago, he would be managing Gannett newspapers in New Jersey. Instead, the executive is living and working in paradise,” observes MidWeek. The downside is they are the _only_ major daily left in Hawai’i, right? At most there were only two daily broadsheets: the Advertiser and Star-Bulletin prior to 2010. Plus, there’s USA Today (distributed in all the hotels), Wall Street Journal, New York Times, etc. (some of which even provide home delivery). The Chronicle is still popular on the islands too. 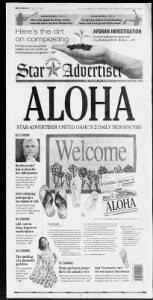 Having said that, The Star-Advertiser is still the biggest on the islands; but of course, one-newspaper towns are everywhere: Sacramento, San Diego, Denver, Boise, Charlotte, Indy, Kansas City, Louisville, Memphis, Minneapolis, Omaha, Phoenix, St. Louis, etc. Tulsi Gabbard was a good example.